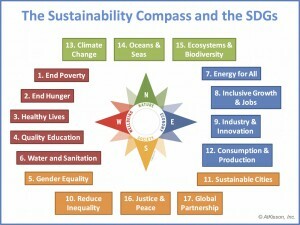 In celebration of the upcoming global agreement on the Sustainable Development Goals, AtKisson Group is today releasing a simplified version of its widely used professional tools for sustainable development, the Accelerator. The Accelerator Lite package — which comes with manuals and PowerPoint slides — shows you how to use the tools in teaching, presenting, or working with the SDGs. Licensing terms permit the use of the Accelerator Lite tools in educational and non-commercial contexts. For more information, visit the Accelerator Lite download page.